Trimming your tribe. 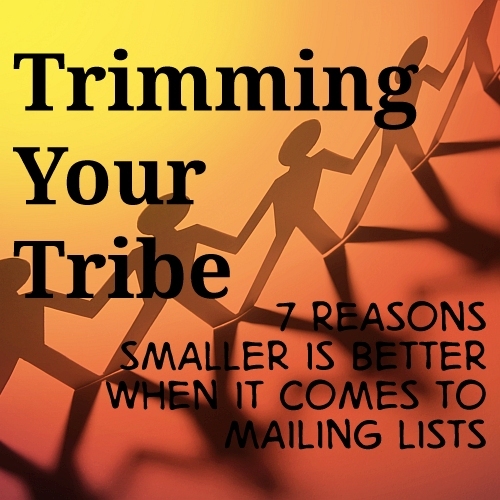 7 reasons a smaller mailing list is better for you as an author. It may not sound like big potatoes compared to Stephen King, but as my mailing list grows towards 1000 readers, I'm trimming the tribe. And you might want to consider it as well. 1) Smaller lists are cheaper. Most services charge more as your lists grow. Trimming them regularly to get rid of those who don't read your emails will keep these charges down. 2) Smaller lists are targeted. You'll have a better idea who's reading and what their needs are. Remember, you can't please all of the people all of the time - so quit trying. 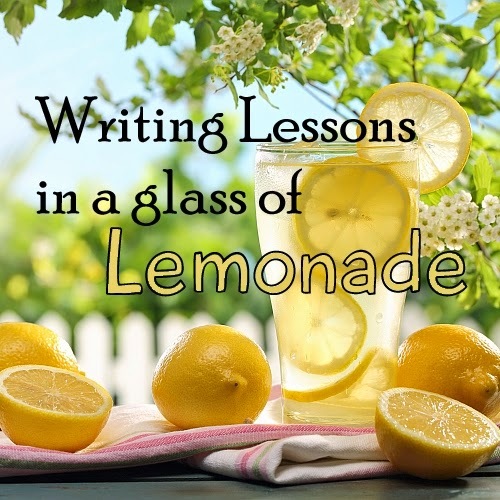 The lemonade-stand marketing lesson every indie author needs to read. One sizzling summer day, my daughter decided to run a lemonade stand. Maybe your kids did this too, once or twice? She set up shop in front of our house. She had a sign, a table, fresh cold lemonade (mmm, I’m making myself thirsty – it’s super-hot here as I write this! ), and opened up for business. What did she do wrong? She was certainly cute enough. And the lemonade was sweetly tart, frozen and refreshing. But we lived on a one-way street that didn’t get a lot of traffic. People were driving past quickly and weren’t in a mood to buy lemonade. She sold a couple to our neighbours, but really didn’t attract a lot of interest beyond the immediate area. It was down the street from a police station, so everyone was driving slowly and paid attention to the little girl with the lemonade stand. Are your books too babyish? The grown-up way to write kids’ books, with 3 easy fixes. Writing for kids keeps us young at heart. How great is that? But maybe you’ve made the mistake of thinking that “young at heart” means writing in a childish way. Are you underestimating your readers’ intelligence? Is your children's book TOO childlike? Sure, we’re writing for kids. Sure, I feel like a kid when I write. But we shouldn’t make the mistake of creating books that sound like they’re written by kids – or worse, babies. Here are three common problems, and quick fixes to make sure you don’t fall into these traps. Language development experts say parents should try to speak normally to even the youngest kids. Some “goo goo” is fine if we’re playing around, but when you’re talking to a baby, you should make an effort to use real words. Same thing if you’re writing for kids, even babies. Use real words. A grown-up is going to be reading the story, so you don’t have to worry that your words are too hard for kids to read. Would writers REALLY do this? I assure you, they would. I’ve seen some horrors out there. But you’re the one I care about: don’t you do it. If this is the 15th of the month (which it is), then this must be... the Jewish book carnival! Don't be scared, even if you're not Jewish, you can step inside and find some great books and writers about books from all over the internet. What goes on in a Jewish book carnival? The Jewish Book Carnival also has a GoodReads page, for discussions and more. Whether or not you’re participating, we hope you’ll stop by, join and take part! April’s carnival rolled out over at Jodie Books. June’s carnival will happen in one month’s time at Life Is Like a Library . And this month’s carnival is… well, right here, silly! If you want to host a future Jewish book carnival on your blog (and who wouldn’t?!? ), contact Heidi at heidi@cbiboca.org. What should you name your characters? As much as we writers might like to think that story is all about plot, usually it comes down to character instead. This is especially true in a children's book, when you sometimes have less than 500 words to impress your reader. Have you met Ian Falconer's spunky pig Olivia? Would she have been just as quirky and charismatic with a name like Patty Pig? You'll want to avoid these 5 critical mistakes to make sure you're creating a character kids can get into. Without a character we love, the greatest plot in the world is worthless. Patty Pig, Danny Dog, Ronald Robot, Big Bad Bertha, Eddie the Engine... with very few exceptions, alliterative names are terrible names, and editors tend to cringe when they see them. If there's one thing that's the mark of an amateur, this is it. Remember the story of Tikki Tikki Tembo-no Sa Rembo-chari Bari Ruchi-pip Peri Pembo? Certainly, if you have read it, you'll never forget his name! That said, check to make sure the name you're using is authentic. Tikki Tikki Tembo author Arlene Mosel neglected to do this, whether intentionally or not. There is no such Chinese name, and apparently, many other "Chinese" details in the story are actually Japanese. The tale itself may come from a Japanese folktale.